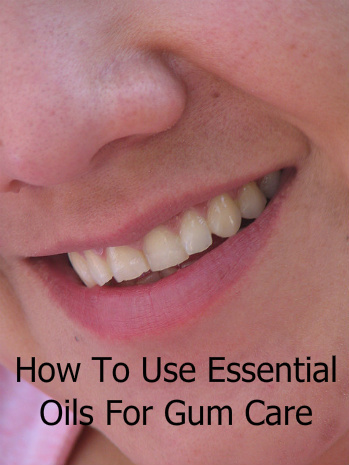 Using essential oils for gums to help keep your mouth healthy is an alternative to buying pre-made mouth care products. Even many toothpastes and mouthwashes on the market contain essential oils such as myrrh, eucalyptus, peppermint, and thyme, which studies have shown help fight bacteria. One study concluded that evidence indicates using essential oils, in addition to standard oral care, helps reduce plaque and gingivitis compared to placebo or control. Mix the ingredients in a dark bottle. To use, shake the bottle well and put 1/4 teaspoon of the blend in 1/8 cup water. Swish in your mouth for at least one minute. Do not swallow. See 11 Ways To Make Toothpaste and How to Make Homemade Mouthwash. In particular, a toothpaste or mouthwash containing clove or tea tree essential oil may help prevent gingivitis. For bleeding gums, the Essential Oils Desk Reference recommends clove, geranium, wintergreen, cinnamon, peppermint, mountain savory, or myrrh essential oil. Dilute one of the oils at least 50/50 with a carrier oil (more if you find the blend too strong) with carrier oil. Apply 1 to 2 drops of the blend to your gums 2 to 3 times a day. After cleaning your teeth, rinse your mouth with 1 to 2 tablespoons of the blend. Do not swallow.